A high school friend gave me this recipe which she found on Pinterest. These sound easy to make and delicious. Prepare them for perfect snacks at work or on the go. If you know the original source, please let me know. Substitution ideas can abound for just about any of these ingredients! Feel free to substitute in your favorite nut butter (almond butter, sunflower seed butter, etc.) for the peanut butter. 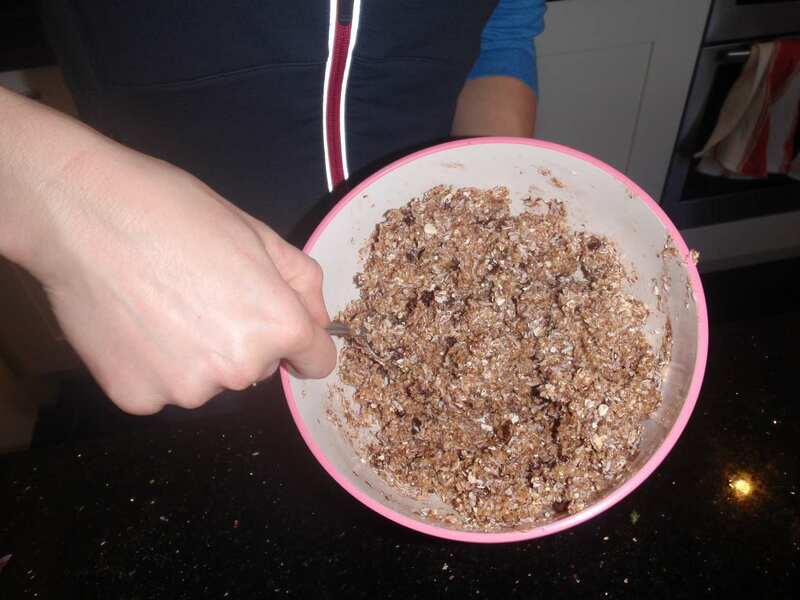 And you could also add in some wheat germ in place of some or all of the flaxseed. I would caution, though, against substituting agave nectar for the honey, as the honey’s thickness helps hold things together. 1. 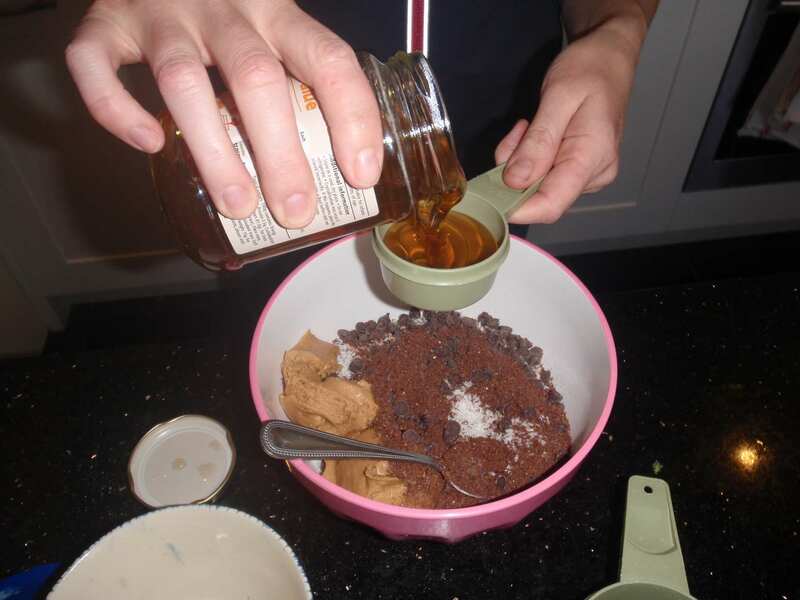 Stir all ingredients together in a medium bowl until thoroughly mixed. 2. Let chill in the refrigerator for half an hour. 3. 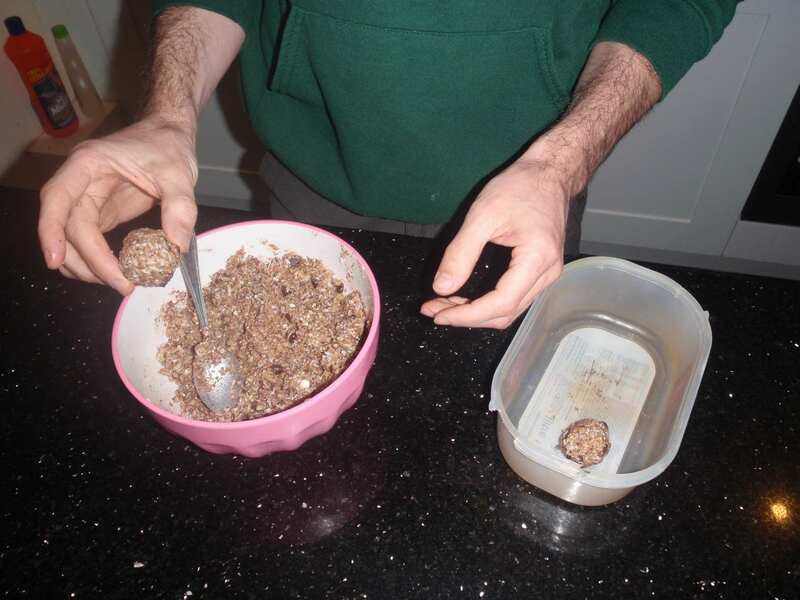 Once chilled, roll into 1 inch/2cm balls. 4. Store in an airtight container and keep refrigerated for up to 1 week. I am going to give this a go over the weekend with whatever I can find in the cupboard. Photos to be posted soon! I made this for my husband using regular coconut flakes, chocolate chips, and only 25g of Linwoods milled flaxseed cocoa and berries. I invested in the small variety pack to experiment with flavors. We were lucky because the first batch was delicious! Next, we have everything mixed together and ready to be chilled. Finally, my husband (I didn't get that hairy so quick) is rolling together his snack. These were delicious and a total energy boost. I wasn't sure if I would like the coconut but you can't really taste it. The peanut butter isn't overpowering either. Fun, easy, and oh-so-yummy! Cool, I will have to try that next. Thanks Amanda! I'm very impressed by the detail of your blog posts about the health. This is going to be very helpful. Thanks for sharing your thoughts.